When it comes to time, as with so much else, accuracy is everything, but sometimes perfection is simply the point at which something just feels right. Simon Allen of the Clock Work Shop at Abbotsbury is explaining why the precision tolerances achieved by the best engineers do not necessarily make them great clockmakers. And in a nutshell Simon deftly encapsulates the art and craft of his trade – some can do it; most can’t. 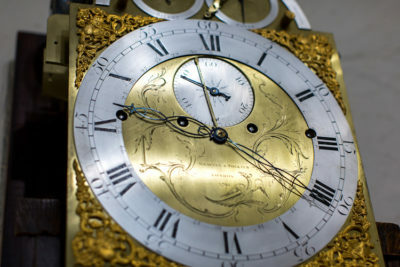 He is an antiquarian horologist, a clockmaker who specialises in the repair and restoration of antique clocks, and the sales floor at the Clock Work Shop has more in common with an exhibition space perhaps than with a high street retail outlet. The clocks on show all tell the time but these are far from ordinary timepieces and range from the rare and sought after, to the highly prized and historically important. What’s particularly striking though – apart from the quarters, halves and hours that duly arrive, like clockwork in fact – is the incessant tick-tocking. Somehow it manages to speak simultaneously of both urgency and relaxation, of the need to move on and be still. Although he’s still in his thirties, Simon has the tuned ear and time-honoured wisdom more readily associated with a master craftsman of older vintage. He puts much of that down to his close friendship with the world-renowned clock dealer Gerald Marsh of Winchester. ‘I was his final apprentice and, like me, he came to the trade with nothing. He worked his apprenticeship then bought the business, all the time bringing on other apprentices, until he sold up as I finished mine. He made sure we’d all be kept on, but I decided to go it alone and I think he appreciated what I was doing and ever since he has been ready to offer help and advice. For all the ambition there’s also clearly a vocational aspect to horology for Simon, but surprisingly clock making was not his first love. ‘That was cricket,’ he reveals. ‘Growing up that’s all I wanted to do and I did well enough to get into the Somerset Academy until I was let go at nineteen. It was a blow and for a few years I did a series of jobs that went nowhere – I ran a nightclub for a year, which was fun, but estate agency was the final straw. I hated it. Last year Simon’s business merged with the Clock Work Shop, founded in 1996, which moved from Winchester to Abbotsbury three years ago this month (OCTOBER). 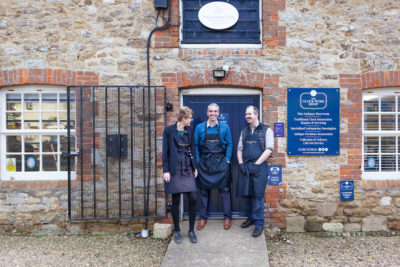 He works with business partners Richard Scorey who takes care of the Winchester shop, and Kevin Hurd, who is in Abbotsbury once a week, giving Simon time to make house calls. Horologist Tom Hannagan and apprentice Jess Yarham-Baker complete the team. ‘I think there’s a certain type of person who’s into clocks,’ says Simon. ‘They seem to have time to appreciate things and will take time to share stories. These clocks will be around for years to come so I can certainly see a future for this trade regardless of how technology evolves. That has always happened – when did you last read a sundial? The earliest clocks were typically made for the wealthy by blacksmiths and up until the invention of the pendulum in the second half of the seventeenth century would have only had hour hands. Within fifty years or so the mercury pendulum countered the tendency for pendulum rods to vary in length and speed with changes in temperature, enabling more consistently accurate timekeeping and minute hands were added. The workings are based on a number of mechanical gear trains – the more trains the more complex the clock – and the constant movement of brass wheels on steel pinions produces wear and tear that culminates in the need to repair.